ADOM :: Got a text from your pastor? Don't give! Also on Google Hangouts: A message purportedly sent by Auxiliary Bishop Peter Baldacchino, pastor of St. Kieran in Miami, to one of his parishioners. MIAMI | If your pastor texts or emails you asking for money or a gift card, saying it’s an emergency, don’t give. It’s not your pastor. It’s a scam. It’s happened to at least three South Florida pastors but it’s not just a local problem. The Diocese of Austin, Texas, also reported the scam, and the Texas attorney general issued a consumer alert about it. The alert said the scammers are probably using information found on church websites or in church online bulletins to trick church members into parting with their cash. 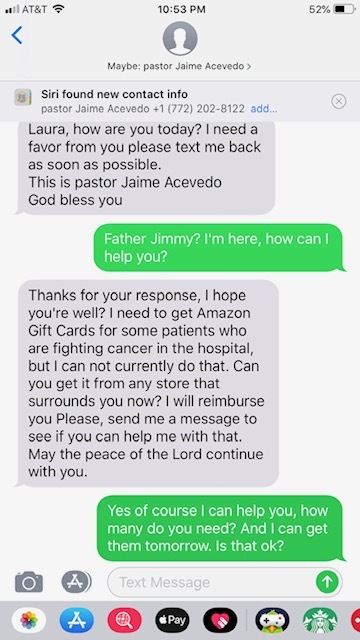 Image of a scam: Text message purportedly sent by Father Jaime Acevedo, pastor of St. Mark in Southwest Ranches, to one of his parishioners. But the text did not come from the priest’s cell phone or parish number, and the fact that the scammer referred to “pastor Jaime Acevedo” might have been another clue it was a scam. Catholic priests don’t normally refer to themselves that way. Father Acevedo sent a screenshot of the text to Sister Elizabeth Worley, archdiocesan chancellor for administration, to make the archdiocese aware of the problem. He also sent an email to all his ministry heads “to advise them not to respond,” he said. Similar announcements were made at St. Kieran Church in Miami, Our Lady of the Lakes in Miami Lakes and Prince of Peace in Miami. This scam is probably a variation on others: texts and robocalls purportedly from the IRS threatening the recipient with jail time and fines for not paying back taxes, or from utilities threatening to cut off electricity or phone service for non-payment. In Florida, scams can be reported to the office of Attorney General Ashley Moody by filling out a form at http://myfloridalegal.com, or calling the Fraud Hotline, 1-866-966-7226. They dangle bait — usually money. Let's face it: People simply don't give away large sums of money easily. If someone dangles bait in front of you — a big prize, a shopping spree, an easy loan — for nothing, they're probably lying. They want your personal information. Anytime anyone asks for your personal information — bank accounts, social security number, etc. — you should be on alert. Don't give it away quickly or easily, especially to someone you don't know. You may become a victim of identity theft. You have to pay them first. If someone offers you a prize, debt relief, or employment — but first you have to pay an upfront fee to get it — you're probably being scammed.